Home » Cocoa butter-100% natural product without preservatives. Cocoa oil is extracted from cocoa beans using cold compression which preserves the natural nutrients. It has a compelling chocolate flavor and a melting point of 35 ° C. Melts on body temperature and is readily absorbed by the skin. Creates a barrier between the harmful effects of the environment / sun, wind / and skin. 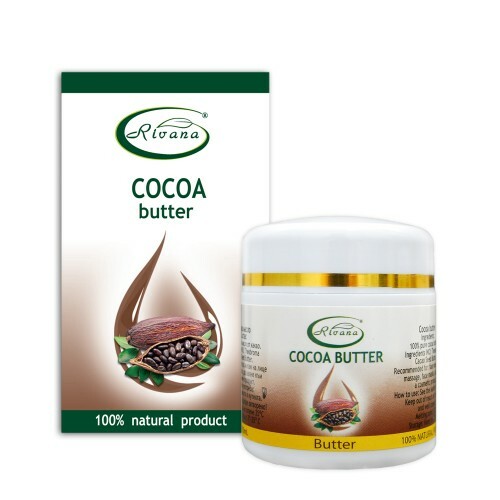 The cocoa butter contains natural antioxidants, and is rich in vitamin E. For centuries, it’s been used for moisturizing and softening the skin. The oil soothes and moisturizes the skin, helps delay the signs of aging, stimulates collagen production, prevents the appearance of wrinkles and stretch marks in pregnancy, improves skin elasticity. Suitable for all skin types. Cocoa butter helps the blackening of skin, and gives an even tan, prevents moisture loss and the appearance of pigment spots. Apply directly to the skin by massage movements. The oil liquefies rapidly in contact with the skin, is easily absorbed, moisturizes and gives a silky and shiny. The cocoa butter is melted in a water bath, add essential oils, depending on the type of massage that will be made. Apply all over the body through massage movements.